Addis Ababa (Ethiopia) – January 25, 2019 (travelindex.com) – Ethiopian Airlines, the largest Aviation Group in Africa and SKYTRAX certified 4-Star global airline, is pleased to announce that it will restructure its U.S. network, adding frequencies and shifting gateways as of the summer of 2019. The new U.S. network is aimed at giving passengers travelling between the U.S. and all over Africa the best possible connectivity and shortest routes, whether they are traveling for leisure, business or government work. Accordingly, Washington D.C. flights will be increased from current daily to ten weekly flights. The new additional three flights will pass thru Abidjan with service continuing on to Addis Ababa. The current three weekly flights to Chicago will be increased to five weekly flights. From the planned daily flights from the New York area to Addis Ababa, four will be served via Lomé from Newark and three will be via Abidjan from JFK Airport. Lastly, there will be a new gateway, Houston, which will replace Los Angeles, and will operate three times per week to Addis Ababa via West Africa. The new Houston flights will be the only connection between Houston and Africa and will facilitate the travel of the huge African community in the Houston area, as well as oil and other companies doing business in the continent. Flights will be served with latest technology aircraft, the Boeing 787, which offers unparalleled on-board comfort. Regarding the route restructuring, Group CEO of Ethiopian Airlines, Mr. Tewolde GebreMariam, remarked, “The U.S. is among our most important markets owing to the presence of a large African community and growing business and tourism ties with Africa. Our new route structure with additional frequencies to multiple gateways and the opening of the new route to Houston are aimed at responding to the market demand and availing the best possible connectivity to over 60 African destinations. Further details regarding start dates and timetables for the new services will be forthcoming. 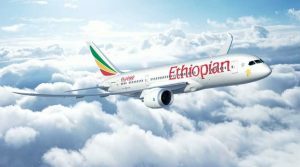 Africa’s leading carrier, Ethiopian Airlines, has been expanding its international destinations which have now reached more than 119. Manchester, Moscow and Mogadishu are just some of the new destinations the airline launched recently. Ethiopian Airlines (Ethiopian) is the fastest growing Airline in Africa. In its seventy plus years of operation, Ethiopian has become one of the continent’s leading carriers, unrivaled in efficiency and operational success. Ethiopian commands the lion’s share of the Pan-African passenger and cargo network operating the youngest and most modern fleet to more than 119 international passenger and cargo destinations across five continents. Ethiopian fleet includes ultra-modern and environmentally friendly aircraft such as Airbus A350, Boeing 787-8, Boeing 787-9, Boeing 777-300ER, Boeing 777-200LR, Boeing 777-200 Freighter, Bombardier Q-400 double cabin with an average fleet age of five years. In fact, Ethiopian is the first airline in Africa to own and operate these aircraft. Ethiopian is currently implementing a 15-year strategic plan called Vision 2025 that will see it become the leading aviation group in Africa with Six business centers: Ethiopian International Services; Ethiopian Cargo & Logistics Services; Ethiopian MRO Services; Ethiopian Aviation Academy; Ethiopian ADD Hub Ground Services and Ethiopian Airports Services. Ethiopian is a multi-award winning airline registering an average growth of 25% in the past seven years. Copyright © 2019 Cambodia Tourist. All rights reserved.